Why is the Leaders Jersey Pink? Funnily enough the reason for this is the very same reason that the Tour de France leader’s jersey is yellow. Both races began as an idea of journalists working for major sports magazines or newspapers as they were back then to promote the newspaper’s sales. In France L’Auto Magazine (which has since become L’Equipe) was printed on yellow newsprint while in Italy, La Gazzetta dello Sport was printed on pink paper. And that’s the truth…not the NZ Truth for those old enough to remember that little rag……! Ryder Hesjedal says the Giro was all about riding style this year and his new RCA cycling colours were inspirational in his win. 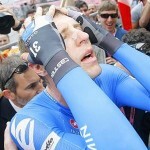 Hesjedal wins Giro 2012 - Gorgeous in pink too!